Termites - "WDI" - What you need to know as a home buyer or owner. Termites are social insects that live in large colonies, produce overlapping generations, and take care of their young collectively. They divide labor among workers, solders and reproductives. Subterranean termites nest in the soil and can attack structures by building tubes that connect their nest to wood in structures. Aerial nests can occur without a ground connection if all castes of the colony are present and moisture is available. Subterranean termites are insects that feed on wood, frequently becoming pests of homes. There are two types of termites commonly encountered by homeowners: the worker and the swarmer. Worker termites are creamy colored, 3-4 mm long, and typically only seen when a mud foraging tube is broken, or infested wood is broken open. Swarmers are the reproductive cast of the termite colony. They are approximately 4 mm long and dark brown or black in color. They may or may not have wings, as the swarmers lose their wings shortly after emergence. Subterranean termite workers can be found year-round, though swarmers are usually encountered between the months of March through April in Texas. Swarming flights of the most common Texas species, the eastern subterranean termite, usually take place during daylight hours. Control - The presence of termites indoors generally means professional treatment is needed to prevent damage to the home or structure. "As one of your biggest financial investments, protecting your home should be a high priority. Termites cost Texas homeowners hundreds of millions of dollars each year. Everyone who owns a home owes it to themselves to be able to recognize a termite problem and know what to do about it. This publication provides answers to the most commonly asked questions about termites and termite control. Q. What are these black, winged insects in my home? A. Adult reproductive termites are dark-brown to blackish insects, about 3/8 inch-long. Commonly referred to as “swarmers”, the job of reproductive termites is to mate and start new colonies. 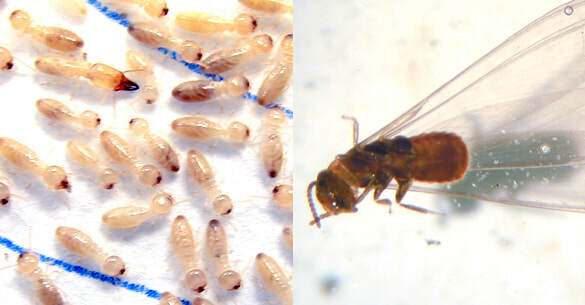 Termite swarmers may or may not have wings, as their wings often are shed shortly after flight. Swarming termites are often confused with ants but can be distinguished by two simple characters. Termites lack the “pinched” waist of ants. Also, termite wings are equal in length, compared to ants that have distinctly longer front wings. Although termite swarmers can, occasionally, enter homes through open doors or windows, finding termite swarmers indoors is a reliable signal of infestation. Termite swarms can occur throughout the year, but are most commonly seen between the months of February and May in Texas. Q. I just found termites in my yard. Does my house need to be treated? A. Not necessarily. In Texas, termites abound in the soil wherever wood is to be found. Most yards, especially those in older, established neighborhoods, support termites. While termites are more abundant in some locations, chances are good that your yard has termites. Finding termites in a fence or woodpile, or in landscape timbers, does not necessarily mean that your home needs to be treated, but it should alert you to the presence of termites around your home. Hollow tubes constructed from soil, climbing up a foundation is a sign of termite activity. Should you find termites in your yard, a few simple steps can help reduce your risk of becoming infested. First, familiarize yourself with what termites look like so that if you notice swarms of any unusual indoor insects, you will know whether your house should be inspected. Second, examine the foundation of your home to see whether mud shelter tubes are present that might indicate termite activity. Termite shelter tubes are hollow soil tunnels extending from the soil to your house, and provide runways for termites to travel between their underground nest and their food supply (your home). If you find any suspicious mud structures, leave at least part of the material in place for a professional termite inspector to examine. Finally, keep soil and debris, such as stacked wood, away from the foundation of your home. This reduces the chance of termite entry and makes it easier to inspect your home for termite signs. If you suspect termites, it’s a good idea to have a professional inspect your home. Termite inspections are often free, unless you need a formal report for use in a real estate transaction. Q. Can I treat my home myself? A. Because of the specialized equipment and chemicals needed to effectively and safely treat your home, it’s nearly always best to hire a professional. Do-it-yourself termite control chemicals are commonly sold through feed, hardware, and nursery supply stores. For spot treatments, in a very limited area, these products may be as effective as some professional products; however it takes a professional to thoroughly treat a home. Do-it-yourself termite control projects should be limited to smaller, less valuable structures such as sheds, fence post, decks and wood piles. Q. How dangerous are these termite control chemicals? A. All pesticides should be considered potentially dangerous; however, when used properly, termite control products (termiticides) can be applied quite safely. Your chance of being exposed to trace amounts of pesticide after a termite treatment is low–less than the exposure risk following a spray treatment for cockroaches or fleas. This is because a termite treatment is generally directed into the soil under and around the home, rather than to indoor portions of the house. As an added precaution, children and pregnant women should plan to leave the home during an application and the home aired out for 1-2 hours following treatment. If these precautions are followed, risks are minimal and you should notice no unusual odors. Although toxicity does vary slightly among commercial termiticide formulations, in practice there is little difference in consumer safety among the different termiticides when used properly. Q. Each company tells us that the termiticide they use is best. How do I know what to believe? A. Most termite control professionals develop a preference for one or more termiticides based on their experiences with that product. Because product performance can vary from one locality and soil type to another, these preferences may be quite valid. Ask salespersons to justify their choice of a product. Inquire about how long that product has been used by the company. Tests conducted by Texas A&M University at five sites throughout the state over the past 20 years show that all currently registered termiticides have a life expectancy of from four to ten years. Non-repellent type termiticides (fipronil, imidacloprid, chlorfenpyr) appear to work better (especially in Texas’ alkaline, heavy clay soils) compared to termiticides that are repellent to termites (e.g., permethrin, cypermethrin, bifenthrin). It’s generally better to choose a company based on its service, reputation and warranty, rather than which termiticide it uses. Also, most termite control companies will give you a product choice, should you request it. Regardless of the product used, the highest permitted application rate is generally best and will last longest. This may cost slightly more, but research shows that higher rates result in the best performance over the life of your termite warranty. Q. Does my whole house need to be treated? I’ve been told that a partial treatment will be much cheaper. A. “Spot” or partial treatments for termites can be very attractive because of their lower cost. Whether this is a good idea depends on many factors including future plans for the house, your willingness to take risks and the size of your pocketbook. Spot treatments can be done successfully; however, it’s important to know that termites frequently enter structures at points far removed from the site where they are discovered. Spot treatments frequently come with limited warranties, which may require you to pay for additional treatments should termites reappear in another part of your home. Compared to a spot treatments with a limited warranty, a complete treatment may be a better value. New home buyers, in particular, should be wary of purchasing a home that has recently been spot-treated for termites. A few termiticides on the market use a form of treatment that involves “perimeter only” applications, or perimeter treatments plus spot treatments at suspected activity points inside the structure. Perimeter-only applications should only be done using non-repellent termiticides and only when the label specifically permits this use. Q. I’m confused. One company uses baits and one company uses liquid insecticides applied under my house. Which is better? A. This is the most common question we receive about termite control. Unfortunately there is no simple answer. Both techniques have advantages. Unlike conventional liquid termiticides, which provide a chemical barrier to termites, baits are designed to suppress or elimininate the termite colonies. Baits incorporate a slow-acting toxicant or growth regulator into a suitable termite food. The toxicants in baits are delivered to the colony by foraging worker termites, who share their food with other colony members. Because of their precise delivery system and the small amounts of actual pesticide used, termite baiting systems are generally perceived as the “safest” of the available termite treatment methods. Drawbacks of baiting systems may include a higher price (this is changing with the advent of stations requiring fewer maintenance visits), the delay between installation and termite feeding on baits (not easy to predict how long it will take for termites to begin feeding on a bait, once installed), and the lack of ongoing termite protection once the baiting service contract is ended. Nevertheless, termite baiting systems are being used successfully to eliminate long-standing termite problems in many homes. Pest control companies report a generally high level of satisfaction among their bait-system customers. Baiting systems have a proven track record of success and continue to evolve. It is important to remember, though, that colonies eliminated by baits are quickly replaced by new termite colonies in your yard. Therefore, continued baiting is needed to provide ongoing protection. Liquid insecticides in the soil, applied by a reliable company, provide fast, and usually reliable termite control. The newer, non-repellent termiticides have very high success rates at eliminating termite feeding in a home, even if every potential termite entry point cannot be treated. Another advantage is that soil-applied termiticides persist five years or more in the soil, meaning that there is no need for ongoing maintenance to maintain the protection for your home. While some companies offer extended warranties and/or annual inspections, your protection does not go away if you opt not to continue the contract. Historically soil-applied insecticides have been less expensive that baiting systems. This may or may not be true for your home. Compare quotes and consider long-term maintenance costs and warranties when deciding on the most economical treatment for your home. If you are looking for the “greenest” termite control approach (one which uses the least, or least toxic pesticides), or if your home has proved difficult to treat using standard methods, bait provide a good alternative. Many companies today use a combination of baiting systems and “spot” or partial treatments as part of an integrated termite management system. Q. I’ve recently seen my local hardware store selling a do-it-yourself termite bait. Can I save money by baiting my home myself? A. While do-it-yourself baiting may sound like a good way to save money, these systems have not been well tested and may be more expensive than they first appear. Cardboard used in most do-it-yourself bait stations tends to decay and decompose quickly in the soil, and should be replaced every 3-4 months. This often makes do-it-yourself baiting systems as expensive as professional systems. Tests at Texas A&M University have been unable to demonstrate successful control with do-it-yourself products. Keep in mind that, should a do-it-yourself treatment not work, a money-back guarantee will not cover the costs of expensive repairs due to termite damage. If you have a confirmed termite problem, it’s best to seek help from a professional termite control company. Q. How do these termite detector stakes work that are offered by my pest control company? A. Occasionally pest control companies offer special termite monitoring stations as part of their pest control service. These stations differ from bait stations as they contain no insecticides and provide no termite control. Rather, these devices work by providing an electronic signal or a mechanical pop-up tab to indicate when termites have fed upon the monitoring station. Although these stations provide a clever way to “see” termite activity in your landscape, a positive “hit” to the station should not be interpreted to mean that your home requires treatment. Most urban landscapes have termites living in the soil, but not all homes become infested. If your pest control company points out that you have termite activity near your home, you may want to request an inspection and ask them to point out any risk factors you might be able to correct to reduce your chances of getting termites. Q. What about non-chemical and “organic” controls for termites? A. Several non-chemical and “organic” treatments are sometimes promoted for termite control. These include the use of nematodes and fungi, sand barriers, orange oil and “borate” sprays. “Beneficial nematodes” are microscopic worms that feed on a variety of insects, including termites. Nematodes have not proved effective in treating termites in actual structures and cannot be recommended. Sand barriers are layers of uniform sized particles (2-2.8 mm diameter) that are difficult for termites to penetrate. Sand barriers should be at least 3-6 inches deep and 20 inches wide. They are placed around foundation walls and in bath traps and other slab openings. Sand barriers are not commonly used in Texas because they are too easily disturbed around the outside perimeters of slab-constructed homes. They are more likely to be effective under homes with crawl spaces where the soil is not likely to be disturbed. Orange oil sprays have not been demonstrated to provide termite control in structures. Borate sprays are based on the use of boron compounds, similar to boric acid. Borate salts are water soluble and are relatively low in toxicity. Treated wood effectively prevents termite feeding and many forms of wood decay. The most effective application method is to spray or immerse structural wood with a borate solution prior to, or during, construction. Treating existing homes with borate sprays applied to wall voids or exposed wood provides only partial protection from termites and wood decay, because of the difficulty in obtaining a complete treatment. Applying borate dusts to attics for termites provides no protection from subterranean termite attack. Recently stainless steel mesh barriers have become available for preventing termite entry into homes. These products are generally available for installation at the time the house is constructed and should provide excellent termite protection if installed correctly. Q. How important is the warranty? A. The warranty is one of the most important parts of your termite contract. The warranty spells out the conditions and time limits under which the company will assume responsibility for continued termite activity. You should compare the warranties offered by different companies carefully. In addition to the standard one-year warranty, you should be offered the chance to extended your warranty for one or more years. Annual warranty renewals should not exceed 20% of the original treatment cost. Extended warranties are a good idea, at least for the first one to two years after treatment, or for at least one year since termites activity was last detected. Q. Do I need a warranty that covers Formosan termites? A. The most common termite pest species in Texas are subterranean termites in the genus Reticulitermes. Another termite species, the Formosan termite, Coptotermes formosanus, is a foreign pest that has become established in California, Hawaii, and parts of the southern U.S. including some areas of Texas. This species is more destructive than our native termites. Unless you happen to live in one of the few communities along the upper Texas Gulf coast where Formosan termites are established, there is little need to purchase a pest control contract solely because it includes coverage for this species. The few isolated cases where Formosan termites have been detected in central and north-central Texas appear to be related to use of recycled railroad ties used as landscape timbers. If you are aware of one of these infestations in your immediate neighborhood, discuss your options with your pest control inspector prior to purchasing a contract. For most homeowners warranties for Formosan termites are usually unecessary. To find out whether the Formosan termite is a problem in your area, contact your county Extension office."